I can be a big drag. My efforts to avoid conflict, wasting money, and extra work ends up sucking the fun out of things. When hubby suggests ordering pizza…We shouldn’t eat out. I just went to the grocery store. When the boys start wrestling…Stop! Someone’s going to get hurt. When the boys want to make a fort in the living room…I just cleaned up. Can’t we leave it this way for 30 minutes? Why am I such a party pooper? The voice of responsibility in my brain is serious. A little too serious. I finally rifled through the papers from the last day of school. Yes, they’ve been on my kitchen table all this time. No, I’m not nearly this disorganized in real life. Oh, this is real life. Well, my party-pooping responsibility gene does not exclude procrastination. I also blame it on an endless to-do list. I tossed most of the expired papers aside – guess I missed that field trip – good score on that test – note to self: need to work on his writing this summer –totally forgot about that reading log! Then, I found my Mother’s Day gift. Shoot! Better work on his organization, too. I read through the writings. My Mom taught me…how to walk when I was a baby. My Mom made me giggle when…she tickled me. My Mom is special because…she is the best mom in the world. Awww! My Mom is happiest…when we clean. Wait – back up! Mom is happiest when we clean? Uh-oh! Something needs to change. There’s always a need to clean, plan, schedule, do bills, check emails, follow-up on stuff, make lists. For example, how bad is it that my to-do list has a task for making another to-do list? 🙂 Our summer bucket list, to be exact – strawberry picking included. I had been trying to find a date that would work, and the season was nearing its end. I’m endlessly trying to tackle the to-do list. I know I won’t ever lose the responsible side of me, taking care of our family and home. 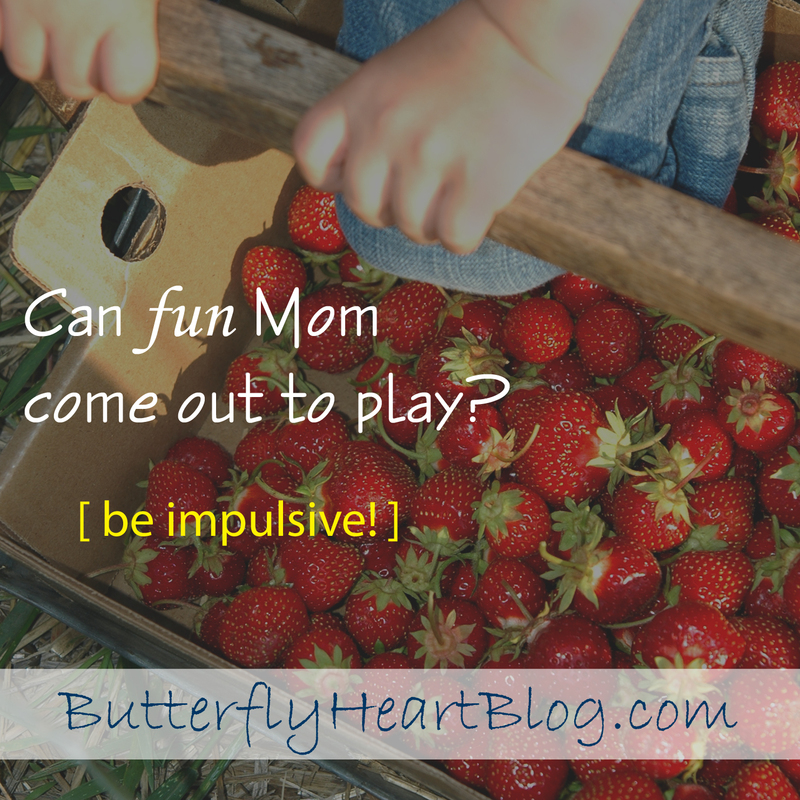 But sometimes, I want to be the spontaneous mom, the fun mom, the let’s-go-strawberry-picking-mom! Which I was just last week. The day was hot. The kids were bored. They needed a distraction. I could see tempers rising with the heat index. The kind of situation where the mood can change, and frustration is just over the horizon. Which I’m trying to avoid with my crusade for a yell-free home. We rushed to search for old clothes and shoes. My oldest didn’t complain once that his unmatched outfit looked strange. I’ve never seen my toddler find his shoes faster (he prefers bare toes). We tossed ourselves in the hot car, blasted the air conditioning, grabbed fast food, and drove west. No one complained the drive took too long. My toddler ate his entire cheeseburger. My oldest ate too fast, and his stomach hurt, but he refused to let me turn around. This idea could go bad, I thought. But I didn’t stress about behavior or boredom or complaints. What happened would happen. What happened was…the Best. Day. Ever! They were angels. My son picked almost as many berries as I did. My youngest even helped, though he ate just about as much. I teased him that we would need to put him on the scale to pay for the ones in his belly. No one stepped on the plants. No one picked the wrong berries. No one complained. A woman noticed, “Now, that’s a really good big brother,” she said. I gushed pride. He is a great big brother. They returned together, my little one still pouring water into his mouth, my oldest carrying a cool drink for me without being asked. Life is good, I thought. On the wagon ride back to the check-out, I felt blessed. Holding my two boys who build a brotherly bond stronger each day. Enjoying the late evening sun on my face, small fingers playing with my hair, and another’s hand on my knee. We searched for butterflies, and reported the flower colors we saw in the fields. We guessed at what was growing in the new rows. We awed at how big the tractor tires were. On the way home, everyone was hungry again. A happy, outdoor afternoon can do that, I guess. So we stopped at a drive-in. It was new to us. We sat at an outdoor picnic table with a giant checkerboard painted on top and hockey-puck sized pieces. What genius came up with this, I wondered? We played while waiting for our food. I realized I can be both moms. The sensible one who needs to keep order in the house and teach her kids responsibility along the way, and the fun mom who can be spontaneous and let go once in a while. At the table, my oldest confessed. Funny how things are a little sweeter when unexpected. It can be small acts like I shared in my post about using a big bowl. Or it can be a little bigger like this road trip to the farm. Either way, spontaneity can add the spice life needs. And remind us to enjoy it. Especially for this chronic party pooper. Note to self: Plan more unscheduled fun in our future! They may end up being the best days ever! Squeeze Your Own Orange Juice (once)!